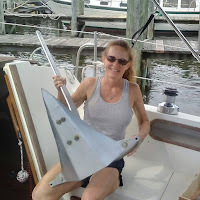 With our heat exchanger issues and stresses of landlubber life, Ken and I took a break this past Saturday and Sunday afternoon and spent some time with friends. When thinking back, Ken and I hadn't been out with other couples in months! We needed to cut loose and have some fun together. Saturday was spent just a couple of streets away in our own neighborhood. 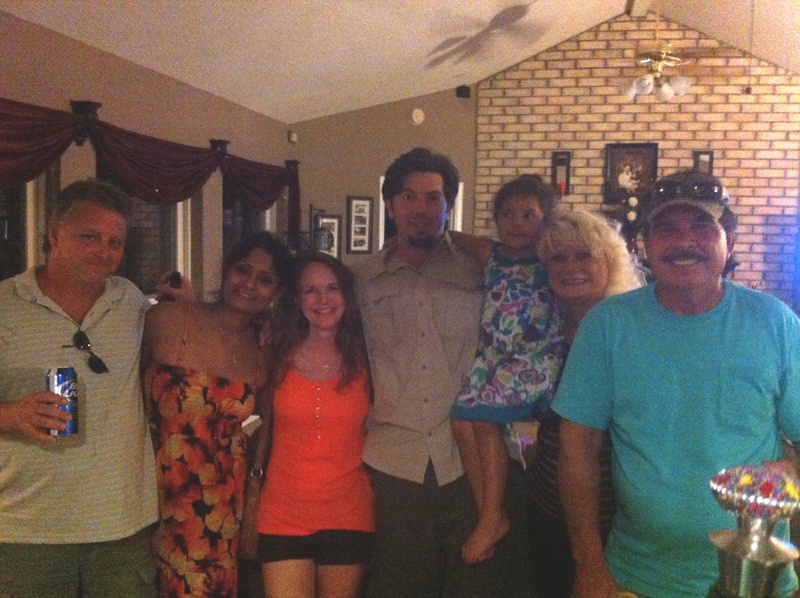 Jared and Shoma (the couple I'm standing in between) were celebrating Jared's birthday! We met last year when they bought a house through me, and we've since become friends. Shoma is an "island girl" from Trinidad ... I love her accent! We knew they'd like our other friends (on right), so it was no surprise when they also became good friends after introducing them last year. Shoma says that Trinidad is a very social island ... always having get-togethers with plenty of music and food. She loves to entertain, and the birthday party was just what Ken and I needed. 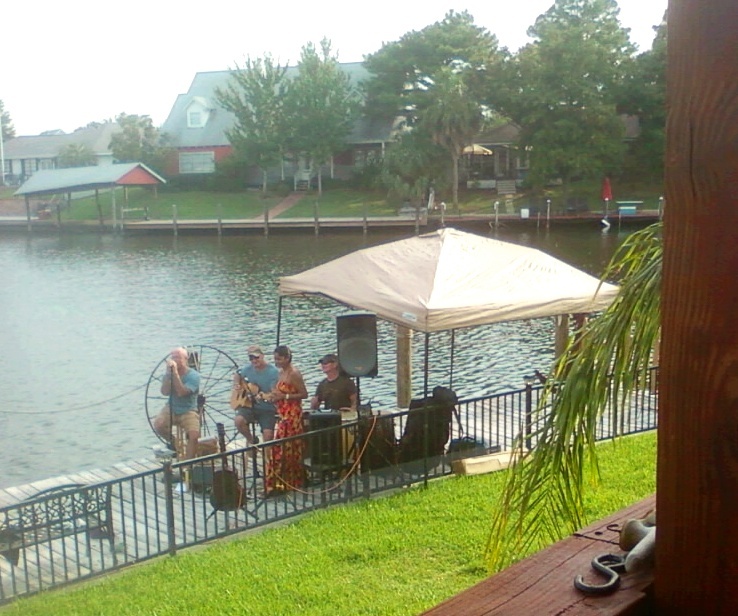 Plenty of good food, home-made wine, and a band too! The three-piece band often play in Biloxi, MS and are friends with the hosts so they played for his birthday. As soon as I saw the bongos, I knew they were gonna be good! 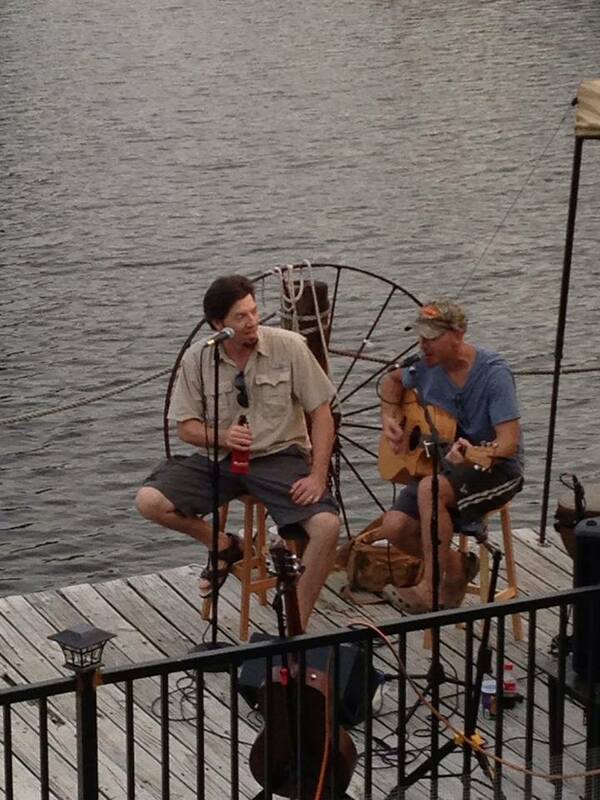 For hours they played acoustic tunes on the dock. Their music choice was perfect for that night ... Van Morrison, Jimmy Buffett, Sublime, Allman Brothers, Matchbox Twenty ... you get the idea. I don't like to take too many pictures at some else's place, but there were a lot of fun people ... good times! Sunday afternoon brought dinner and drinks with two other couples that we hadn't seen in way too long! I met Judy and Julie a few years ago when I joined The Blue Thong Society. They are two of the nicest women I've met, and so are their guys. No pictures of that afternoon, but if you've been following our blog for a while, Judy is our "Mardi Gras" friend! We've been going to New Orleans together for a few years now. I'd like to think we're her "partying" couple! Again, we enjoyed food and drinks outdoors with a band ... this time a two-piece acoustic. It was great catching up with friends, laughing and talking ... two nights in a row! I do believe "those that play together, stay together". This was exactly the kinda therapy we needed. You have to have this kind of therapy from time to time. Way to go you two. I think you're over due for a weekend of fun. I know I'm very thankful that so many people around us are also musically inclined even though I'm completely tone deaf!